With the Wireless Laser Desktop 7000, Microsoft has designed a wireless keyboard and mouse that work well on the Mac, both in an aesthetic sense (especially with the aluminum iMac) and in terms of practical hands-on experience. The Desktop 7000 uses the 2.4GHz spectrum for wireless connectivity, not Bluetooth, so that means you must attach a USB receiver to your Mac. One receiver works for both the keyboard and mouse. Microsoft claims a 30-foot range; in my testing, I had no problems from about 30 feet in a meeting room, with no obstacles between the Desktop 7000 and my MacBook Pro. There were no Mac-specific instructions in the box, but Microsoft does include a Mac software CD containing the drivers you need to customize settings. Luckily, the hardware and software installation is straightforward. The keyboard is an elegant black with a smoke-colored plastic frame and a slight curve to make it more ergonomically correct. I’m a self-taught typist (read: I don’t type the proper, traditional way), and I had to adjust to the curve by turning my hands in a slightly different angle than how I usually hold them over a straight keyboard. But adapting to the curve didn’t hinder my typing speed. I don’t find the curve any more comfortable than a straight keyboard layout, but I’ve been fortunate enough to not have any physical problems when using different keyboard shapes. The keys are easy to press and responsive enough to not disturb the flow of my typing. I prefer the feel of the 7000 keyboard over that of Apple’s aluminum keyboard because it feels more sturdy. Several helpful one-touch buttons rest atop the 7000 keyboard. The upper left has a Back button and Home button that by default are designed for your Web browser, a Mail button for launching an e-mail program, and a Live Call button that defaults to opening Windows Messenger (it can also be programmed to open iChat). 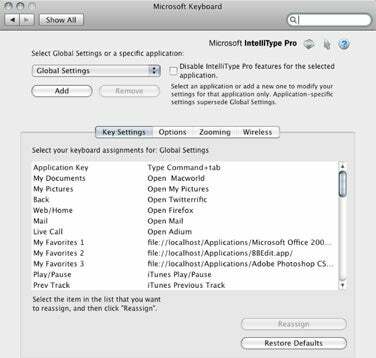 All four buttons can be reassigned using Microsoft’s IntelliType Pro software, which appears as a pane in System Preferences. I easily assigned each button to a program; for example, I assigned the Back button to Twitterrific ( ), and the Live Call button to Adium. The keyboard’s top row also has three touch-sensitive, programmable floating My Favorites keys. With my first test unit of the 7000 keyboard, I had problems with these keys. I didn’t find them sensitive to my touch, and I often had to push a Favorite key two or three times to activate the assigned action. I received a second 7000 keyboard, and the My Favorites keys were much more responsive, requiring only a single tap to active a button's action. You can easily customize the keyboard’s programmable keys via the IntelliPoint software. The 7000 keyboard also has dedicated multimedia keys, which include volume, mute, play/pause, rewind, fast-forward, and a Music button assigned to iTunes by default. If you’re used to using Apple’s aluminum keyboard, the 7000’s multimedia keys are a welcome feature. Other one-touch buttons include My Documents, My Photos, Calculator, and Gadgets (which is assigned to Dashboard by default). Like the other one-touch buttons, these buttons can be reassigned using Microsoft’s software. There’s also a row of F-keys, but like the Apple aluminum keyboard, their use as F-keys is secondary. To use an F-key function, you must first press the F-Lock key. For example, if you want to use OS X’s Universal Access, you have to press F-Lock, then press Control-F1 to enable Full Keyboard Access. When you press the F-Lock key, it remains locked until you press it again—the problem is that there’s no way to tell if the F-Lock key is locked or not (there’s no Caps Lock indicator, either). Microsoft assigned the primary use of the F-keys to common functions for which you probably already use a keyboard combination; for example, the 7000 keyboard has Undo and Redo buttons (F2 and F3, respectively), but you’re probably used to using Command-Z for Undo and Command-Y for Redo, and because those are universal key combinations on the Mac, there’s no reason to change your behavior to accommodate the 7000 keyboard’s buttons. Fortunately, you can reassign these keys to other tasks through Microsoft’s software. The keyboard uses a pair of AA batteries, and the software has an indicator for battery life and signal strength. There’s no recharger for the keyboard, although there is one for the mouse. After about four weeks of use, the included Energizer AA batteries still worked, and the software indicated that the battery level was Good. While the overall appearance of the keyboard is pleasing, there are a couple of characteristics that will turn off the devoted Mac user. There are Alt keys where Mac users expect Command keys, but the Alt keys are mapped to act as Command keys on the Mac (they could have imprinted a cloverleaf on that key to avoid confusion). And there will definitely be people who will look upon that Windows key with disdain. The Windows key is where the left Option key usually is, and it’s mapped as an Option key. The Wireless Laser Desktop 7000 connects to your Mac using 2.4GHz radio frequency transmission. You need to connect a USB receiver to your Mac. Black with shiny chromelike trim, the 7000 mouse has a slight, ergonomically inspired curve to it. The curve is supposed to help the mouse fit naturally in your hand, where your thumb rests in a groove on the mouse’s left (sorry, left-handed mousers), your index finger rests on the left button, and your middle finger rests on the right button. There are grooves on the mouse’s right side for your ring finger and pinkie. After a couple of hours, I found the 7000 mouse uncomfortable. I experienced pain in my thumb and index fingers. I tried adjusting my hand to the mouse several times, but any new position either felt uncomfortable or painful. Eventually, I abandoned the mouse after using it long enough for this review—it’s a shame, because I really like the keyboard. Of course, mice aren’t one-size-fits-all, and many people may find the Desktop 7000 mouse very comfortable. The mouse has five buttons: a left button and right button, a scroll-wheel button, and a pair of thumb buttons. All of the buttons can be customized using Microsoft’s IntelliPoint software. Microsoft includes a charging cradle and a AAA-sized rechargeable battery. When you’re not using the mouse, you can dock it to the cradle and charge the battery. I recharged the battery every night when I left work, and I never experienced low battery power or a drained battery during the day. If you can get over some of its un-Mac-like characteristics, the Wireless Laser Desktop 7000 is an attractive keyboard and mouse set for your Mac—provided that the devices fit you physically. It also offers lots of customizable buttons for quick, one-touch access. I think the 7000 keyboard is one of the better keyboards I’ve used, but it’s not offered as a separate product.